Some of our most common bariatric surgeries are listed below. Each patient is different and requires a different approach. Our team of experts will meet with you, one-on-one, to discuss the best weight loss options for you. The longest existing operative procedure we perform for weight loss is the Roux-en-Y Gastric Bypass and it is considered the “Gold Standard” of surgical weight-loss procedures. 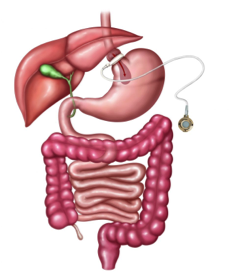 This procedure creates a small pouch out of your stomach, reducing the amount of food you can eat. It also reroutes your small intestine to provide less absorption of nutrients from the foods you eat. This operation has been accepted by obesity surgeons throughout the country and major medical societies as being the most effective in weight reduction and maintenance of weight loss. We perform this surgery using laparoscopic techniques, avoiding a large incision in your abdomen. However, an abdominal incision is sometimes necessary based on your weight, body shape, and previous surgeries. This procedure involves removing 80%+ of your stomach, creating a significantly smaller stomach tube. It limits the amount of food you can eat by making you feel full after eating. This procedure may also decrease your hunger by removing the cells that produce the hormone (Ghrelin) that makes you hungry. 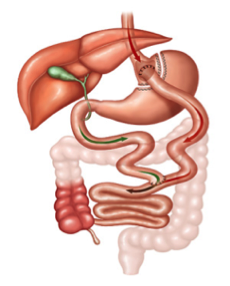 We do not place adjustable gastric bands because of the high number of complications associated with these devices. However, we provide advice, maintenance, and removal of these bands for patients who have had this type of surgery. Our experienced bariatric surgeons can perform numerous revisional bariatric procedures, tailored to each patient’s individual needs. If you previously had weight loss surgery and would like to establish care in our practice or discuss additional options for weight loss, we’re happy to welcome you to our center. We offer two procedures that transfer an initial or original surgery to a different type of procedure, including converting a laparoscopic band to a sleeve or roux-en-y and or converting a sleeve to a roux-en-y. 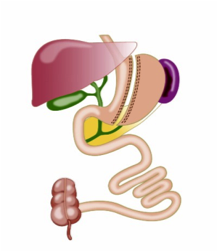 Find out about the benefits and risks of bariatric surgery. Under the leadership of Dr. Alex Ayzengart, bariatric surgeon, and Dr. Moiz Mustafa, pediatric surgeon, UF Health has created a pediatric weight loss surgery program. We are a fully accredited Adult and Adolescent Bariatric Center of Excellence by the American Society for Metabolic & Bariatric Surgery, which is the largest non-profit medical organization in the world dedicated to metabolic and bariatric surgery, and obesity-related diseases and conditions. Learn more about this program and the team. If you are interested in finding out more about obesity, treatments for severe and morbid obesity and the outcomes of surgical treatment, please watch our online seminar. All potential bariatric surgery patients must complete this seminar prior to their first consultation with a UF Health bariatric surgeon.